What would I ever do without my golden hops vine? I just love it. First of all, it looks beautiful, fresh and bright climbing along the fence. Here's a photo I took a few years ago of my first ever Humulus lupulus 'Aureus'. This photo made me think of the old rhyme about what you can expect when planting a perennial vine in the garden: "The first year they sleep, the second year they creep and the third year they leap." So I checked my dates and this photo was taken in June of this happy specimen's second year. So you can imagine how big it gets nowadays! In the spring, it can grow up to 6 inches a day!...to probably about 30 feet long, maybe more. It's amazing. So back to all the reasons why I love this plant. I think it's absolutely beautiful in floral arrangements, almost all year 'round. This one is a late summer wild and natural pink zinnia arrangement I did for a wedding reception a couple years ago. In the late summer and early fall, the decorative strobiles (papery, cone-like flowers) form. I used them here, hanging them all around the bottom of this bouquet's vase. 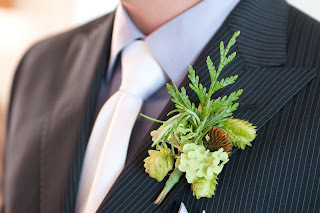 I love using hops in boutonnieres too. They go really well with a little Mayne Island cedar, some rosemary and hydrangea and an echinacea seed head. Some dried hops flowers hanging along the fence in the winter time. If you pick these in the summer and rub them between your hands they release a pleasant, earthy scent and are a bit sticky. One year, I hope to harvest some of these and make some dream pillows. Anyway, look what it says at the top. Family: Cannabaceae (The Hemp Family) I didn't know that! You learn something new everyday. I wonder if someone somewhere ever made twine of hops...and come to think of it, the leaves have a bit of a hemp-like look to them too. A trio of wreath forms. Endless possibilities for these. You can make them neat and tidy or a little more loose and free form. And the year 'round possibilities of greenery, plant material, flowers, berries, mosses, lichen, etc, etc. with which to decorate are also endless! When I cleaned up around the base of the plant, I found some new shoots already emerging. These do seem to show up early every year. I've read somewhere that they're edible and people eat them like asparagus. I must try that sometime soon....perhaps yet another reason to love this plant? We'll see. This year I'll do about 20 pots and the new plants will be ready for sale in the fall for planting out next October through March. If you live in these parts and you'd like a lovely rambling vine for a fence or wall that you can use in flower bouquets or add to homemade herbal tea or make dream pillows with or make wreath forms out of....let me know and I'll put your name on one. A quickly decorated wreath I made with some lichen and moss I gathered on my walk up to the garden one day. Seasonal wreaths and wreath forms are also available for purchase at the garden from time to time. I've never tried to keep the flowers green for a long time and I've never tried spraying them....my experience has been that when I pick the vines with flowers, and make green wreaths, they'll stay green for a few months (if I pick them in Sept, they've stayed green 'til Jan) and then they start turning brown. I wrote about your golden hops! Thank you. thank you for letting me know, I enjoyed reading! One site I looked at said that golden Hops would not do well in full sun...do you agree with that? My husband and I have about 150 ft of chain link fence...we bought 9 golden hops plants yesterday. I am hesitant now in my decision as I am reading that I have to cut back all of the dead vines in Spring....that is A LOT of work for 150 ft of fence isn't it?? I'd love to keep the plants, but please help me to understand their yearly maintenance. Thank you!